can anyone identify this bowl? I wondered if it may be an ambrico piece,the base and glaze looks about right.It's 10cm high x 7cm wide and quite heavy for it's size. still I lean towards Adams, have only seen a few of his with colour-glazed base like that, but have not seen Ambrico in that dense overall green glaze. Cheers again. Re: can anyone identify this bowl? 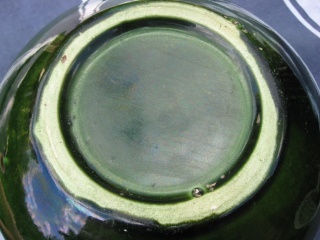 funho1 wrote: still I lean towards Adams, have only seen a few of his with colour-glazed base like that, but have not seen Ambrico in that dense overall green glaze. Cheers again. Thanks, I hadn't even considered Luke Adams,the shape with the idents is unusual. 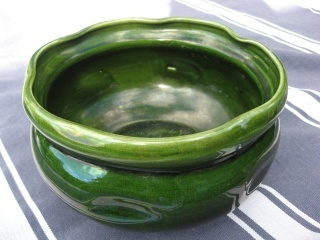 Actually the glaze is not an even green shade all over,somewhat mottled in places and darker in others,it appears to be quite thickly applied.God knows what I did with the photo downloads I can't even view them. How come I can't see any pictures? TimCaulton wrote: How come I can't see any pictures? ok I've checked that out,the glaze on mine is much more even and almost iridescent in places,and I put the wrong measurement in the original post it's 17 cm wide not 7cm. Yeah I checked on that last week,shape and colour is similiar but the glaze is not quite the the same.I'm hanging on to it till I'm sure who made it.